Back in the early 1900s, during the time of the American eagle period in our nation's history, there emerged the grand neo-classical and art deco style buildings in Manila; the Americans even brought in renowned architect and urban planner, Daniel Burnham, famous for shaping city plans of Washington, DC, Chicago, and Baguio, to plan the nation's capital. While the United States' economy traversed the economic downward spiral due to the Great Depression, the Philippine economy rode high with unprecedented growth. Along with this came economic prosperity that made many foreigners coming to our shores dubbed then as the Pearl of the Orient. One of those who came to the Philippines was Laurie Reuben Nielson, by way of New Zealand, quickly made successes in businesses. He later became involved in building an airport and aviation school in Manila, badly needed at that time, due to the booming needs of the economy. 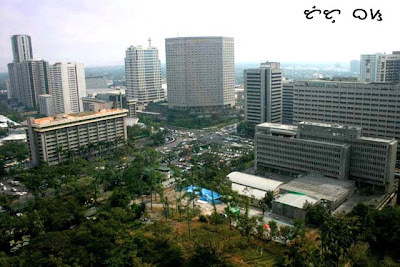 He was able to convince several investors in the airport project and secured a lease from Ayala y Cia for several hectares of land carved out of the vast Hacienda San Pedro de Makati. When war spilled into the country in December 1941 and soldiers of the Land of the Rising Sun overran the archipelago, Laurie Nielson, due to his British citizenship, was taken to Hong Kong while his family brought to the University of Sto. Tomas then converted into an internment camp. Laurie was never seen nor heard from again and his family moved to the United States after the war. When airport subsequently transferred to a new location in Paranaque in 1948, Ayala y Cia, reborn Ayala Corporation in 1968, developed Makati into the present modern city while Nielson Tower, with its art deco-inspired architecture that resemble an airplane if viewed from above, was saved from demolition, converted into a library called Filipinas Heritage Library in 1996. 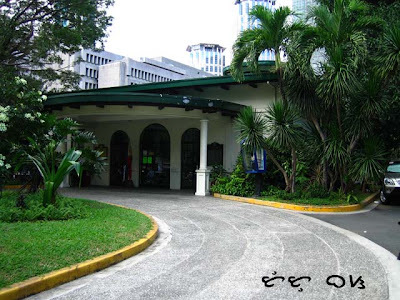 The same award was given to Gota de Leche building in 2003 and Far Eastern University campus in 2005. 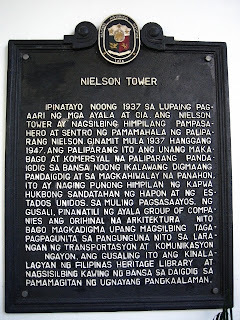 Nielson Tower still stands in an area known as Ayala Triangle while the airport's two major runways are the present day Ayala Avenue and Paseo de Roxas. What a coincidence! I just had a discussion with my friend last night over dinner about the Nielson tower and the library within. She was telling me about a travel writing seminar(of which I am very interested in) that will supposedly take place in there. I loved your post, it's so interesting to read about the history of this place we take for granted in the heart of our CBD. Thanks, this is another history lesson for me. Ambeth Ocampo, step aside. Here's Tutubi! naalala ko nag apply ako sa filipinas heritage library a few years back as an asst. project coordinator. Do they hold photography seminars in this library as well? Oh, thanks for this glimpse on history. I like the view from your office. Di ka nalulula? Ummm.. events management career.. not bad.. why not.. hehehe..
Just had a photo shoot there 2 months ago.You should check out the view of from tower 2! I think that used to be the control tower of the airport. They have this brochure with pics of the old airport. Sana humingi ka. Now the place is open for all kinds of functions even debuts and weddings! yes, the Filipinas Heritage Library holds seminars, workshops and exhibits. oks na trivia, ngayon ko lang nalaman na ang dating runway ang ayala ave at paseo. nakikita ko nga yang library na yan pumupunta ako sa Pag-ibig branch sa makati. swerte mo naman dahil ganda naman ng location ng ofc mo? Someone sent me a really cool old shot of what he described as a "triangular park in the financial district"... could this be the same location as the photo you took from your office window? Check out the PHOTO HERE! I heard about the old airport but I was thinking that EDSA was an old runway and I thought the old Manila International airport was built at its present location.